Climate is complicated. There are so many feedbacks affecting each other that it’s hard to sort out the muddle of cause and effect. To try to get a better handle on the problem of understanding which variations are more fundamental and important, we need to start from some simple observations and work outwards into the problem of understanding the interaction of all the myriad phenomena vying for our attention. Nutshell: Energy comes from the Sun to the Earth, most of which is covered in oceans. The oceans absorb short wave solar energy and emit long wave radiation which heats the atmosphere and the ‘greenhouse gases’ it contains. The atmosphere bounces the radiation down and up then loses the heat to space. A change in global temperature could have four basic causes, or a mixture of them. 1) A change in external forcing such as an increase or decrease in solar activity, or variation in cloud seeding cosmic rays due to the motion of the solar system through the local interstellar clouds, a nearby supernova or possibly the changing orbital configurations of the outer planets affecting the shape of the heliospheric current sheet. 3) An increase or decrease in albedo, principally cloud cover, wind patterns raising dust, and volcanic activity emitting particulates (aerosols), ozone destroying gases and ‘greenhouse’ gases. 4) Changes in Earth’s orientation parameters, orbital parameters, length of day, frequencies of anomalous motions (Chandler wobble) etc. More detail: The amount of energy that reaches the Earth from the Sun, the Total Solar Irradiation (TSI) is modulated by the Earth’s albedo (amount of reflectivity) which varies with changing cloud cover, ice area, flora colouration etc. This changes the amount of solar energy that actually makes it into the oceans, the Insolation at the surface. There is as much heat capacity in the top two fathoms of the ocean as there is in the entire atmosphere above it. The tail does not wag the dog, because the long wave radiation bouncing back down from the atmosphere can’t penetrate the ocean beyond it’s own wavelength. The global ocean is the big dog on the climate block. However, the atmosphere does play a big role in redistributing the heat the ocean emits into it. Along with the ocean currents, the atmospheric currents move heat away from the equator towards the poles, and carry cold water and air from the poles down to lower latitudes. 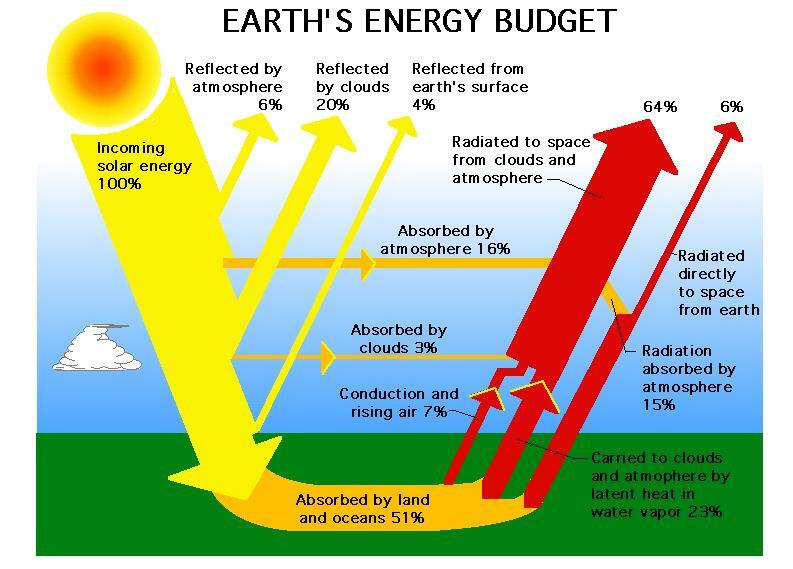 The Earth is a big heat engine, and much of the ‘internal’ climate action is due to the way the Earth (and more importanly ocean-atmosphere) is constantly trying to equilibriate the energy it is recieving from the Sun. There are various ways of looking at the way heat-energy gets around the Earth climate system. Some new and fresh insights have been provided by people like Ferenc Miscolczi, Erl Happ, Stephen Wilde and Willis Eschenbach, describing various ways the Earth’s climate system checks and balances itself in response to changing conditions. Miscolczi for example, demonstrates mathematically why the Earth climate system is in dynamic equilibrium, with a ‘saturated grenhouse effect’. 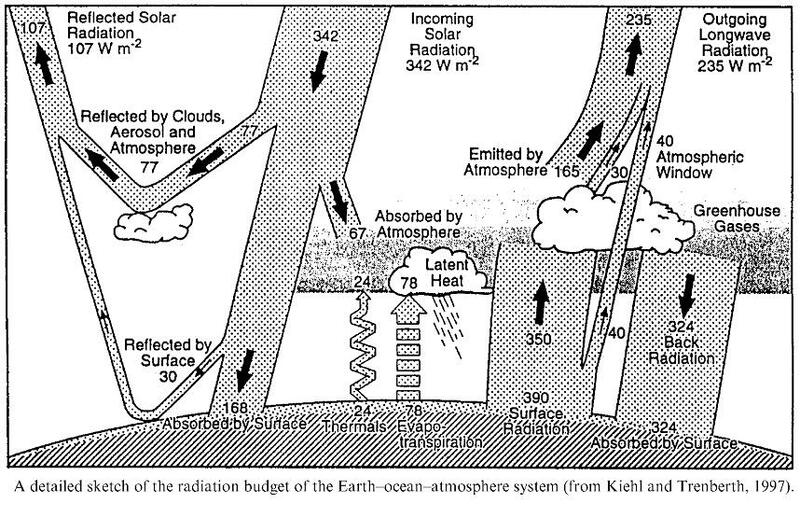 Eschenbach describes how thunderstorms transport heat to the upper atmosphere, bypassing the ‘greenhouse layer’ and shading Earth from the Sun’s irradiance. So if the Earth tends towards equilibrium, why does the temperature fluctuate and precipitation vary so much over centuries? Well the first thing to observe here is that the temperature hasn’t actually varied all that much, maybe a degree or two over the last thousand years. And precipitation, although there decade long droughts in places, has been pretty stable globally too. Let’s look at some of the things which are affecting the sytem from the outside, before we consider internal variation. Because it is subject to outside influences in the interplanetary space weather, the earth reacts to try to equilibriate with it’s surroundings as well as balance it’s internal energy budget. The Sun varies it’s output of radiations and particle emissions over it’s various cycles, the ~11 year Schwabe cycle of rising and falling sunspot numbers. It’s ~22.1 year Hale cycle of reversing magnetic polarity. It’s ~205 year de Vries Cycles, and other longer periods we can see from looking at proxy records such as the C14 tree ring series and the Be10 deposits modulated by galactic cosmic rays, which are more or less repelled by the Sun’s varying activity. These longer cycles coincide with long term resonances in the orbits of the gas giant planets, an example is the 2245 year cycle of the changing synodic period of Uranus and Neptune, which is caused by the cycle of Jupiter-Saturn conjunctions. UV from the sun has altered by 15% recently, and the speed of the solar wind varies considerably with the waxing and waning of solar cycles and the coronal holes which emit the particles. We are still learning about the effects these variations have on our planet and it’s climate system. Also, the motion of the Earth itself as it approaches nearer to and retreats from the sun during it’s yearly orbit causes a big change in the proportion of TSI recieved at the surface. At this point in it’s ~25,000 year precessionary cycle, the Earth gats around 80W/m^2 more incoming solar radiation at the top of the atmosphere above the southern hemisphere’s vast oceans in it’s summer than the northern hemisphere gets. These seasonal variations drive a huge energy difference between different parts of Earth. As well as all this, our nearest celestial neighbour, the Moon, which has the largest variance in gravitational effect on our planet, follows a complex cycle of Lunisolar conjunction and opposition, changing maximum declination, nodal procession and other longer cycles which at times in the history of the solar system have been in strong resonance with the motions of other planets, vastly amplifying their effects on the motion of Earth’s molten core and it’s associated magnetic field, as well as shifting ocean currents and tidal actions. There are many more aspects to climate not even touched on yet, volcanos and earthquakes, thunderstorms and atmospheric waves, el Nino and la Nina, geomagnetism and the global electrical circuit, ocean salinity and overturning. I’ll start weaving them into part 2, along with extra details provided by people who visit and leave snippets of info in comments. Please join in so that we can create a fully inclusive “holistic theory of climate”. Today is the first anniversary of the sad loss of Vale Carl Smith. Carl was a great contributor to the study of solar-planetary theory and started the landscheidt.auditblogs.com blog now continued and augmented by Geoff Sharp at landscheidt.info. Carl was anxious that his work would be continued and extended by others after him and not be forgotten. He can be sure of that. It was the assistance Carl provided to Ray Tomes in his thread on this subject on another forum which enabled me to get to grips with some data and start discovering things for myself. Geoff is dedicated to carrying Carl’s work forward and I’m proud to be doing the same. Carl was a man with a rare clarity of vision and purpose, and willingness to share knowledge. I want to honour those principles he held and work towards a better understanding of Cosmos. 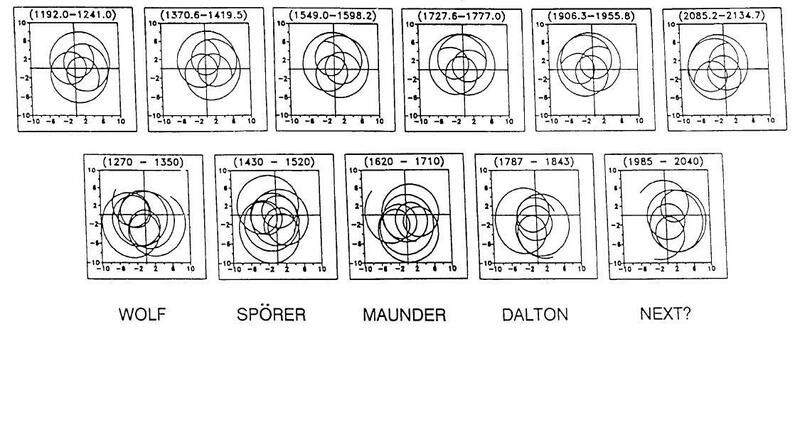 I have reproduced below one of Carl’s graphs showing the relationship between Solar angular momentum and it’s motion around the centre of mass of the solar system. There is a buzz going round the sceptical blogosphere about a paper published by NAS which links to supplementary material carrying a blacklist of sceptical scientists. One of the co-authors is one Stephen Schneider, the well known propagandist and alarmist. 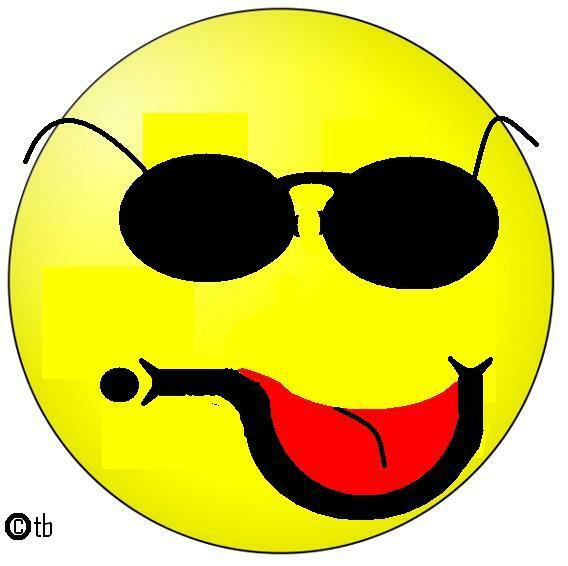 I like the smiley badge idea. 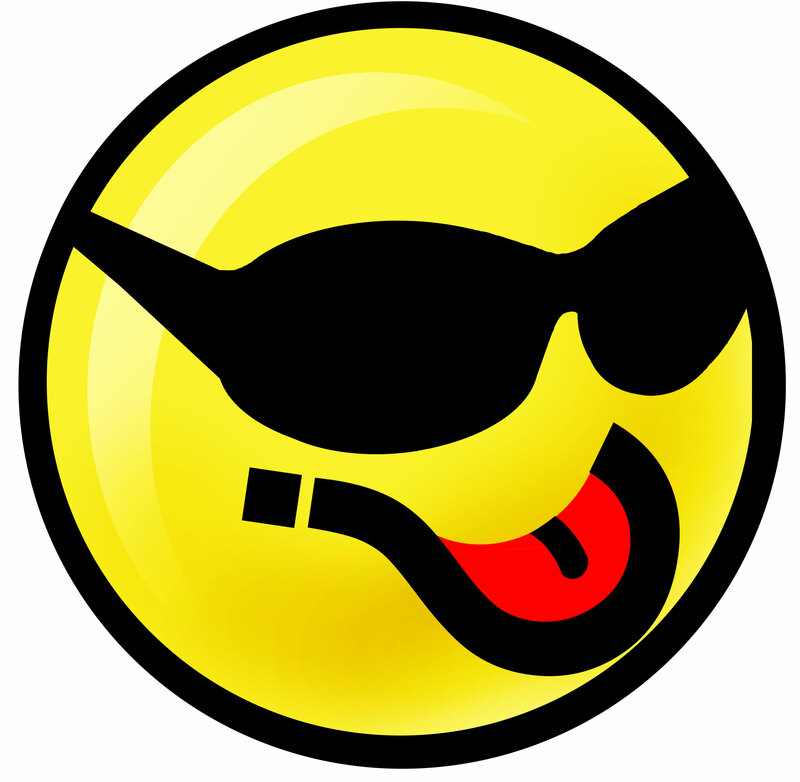 Maybe we could make it specific to sceptics by making the mouth into a question mark. Kind of asking the question and blowing a raspberry at the same time. From the ‘We shouldn’t say we told you so but we told you so’ dept. Those of us interested in ‘Barycentric nonsense’ (T.M. Leif S.) have been saying for several years that the conjunction of Neptune and Uranus which has more or less coincided with the historical solar grand minima of the past indicated that there woud be a big slowdown in solar activity following their latest conjunction in 1993. 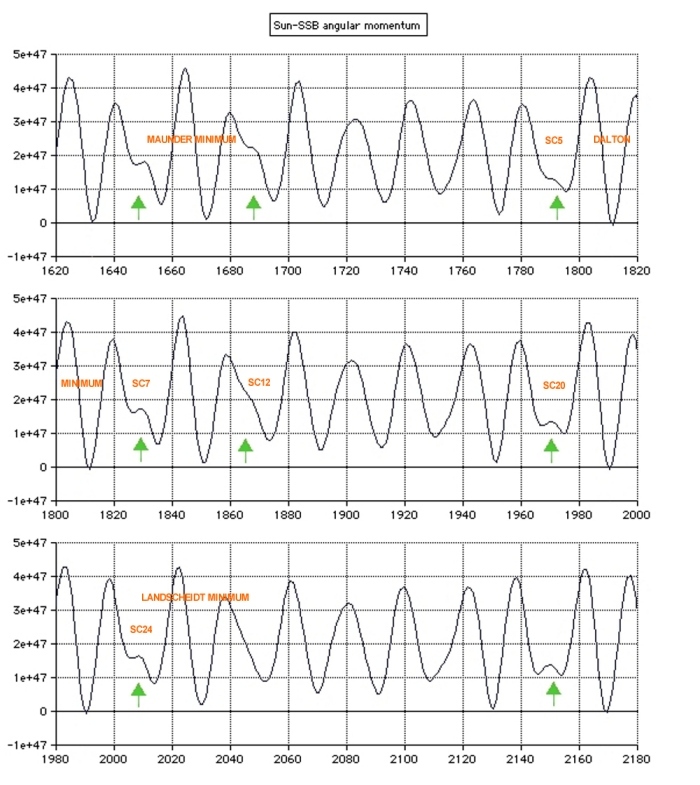 I put up a post on predicting solar activity from planetary motion data some six months ago. 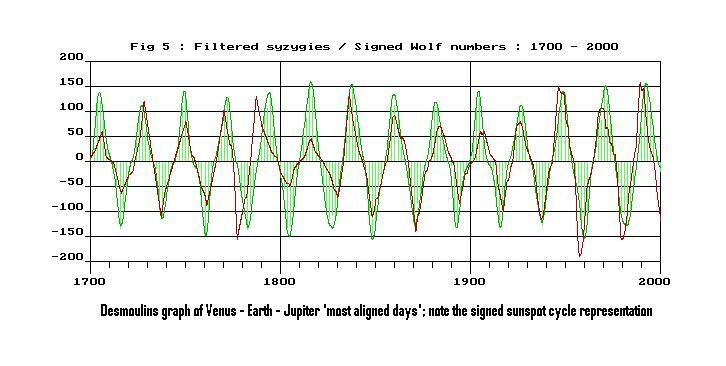 It seems mainstream solar physicists Duhau and de Jager have come to the conclusion that there is going to be another grand minium following the current solar cycle too. There has been much debate over who this minimum should be named after if it comes to pass. Some say Landscheidt was the first to predict it, though he thought it would begin a cycle earlier. Other say Jack Eddy should get the honours, for his work elucidating the Maunder minimum and suggesting a Solar-activity-Earth-climate connection. Some even nominate Al Gore, just to extract the maximum irony. Post your thoughts on this issue and the new paper form Duhau and de Jager below. Journal of Cosmology, 2010, Vol 8, 1983-1999. 1Departamento de Física, Facultad de Ingenieria, Universidad de Buenos Aires, 1428, Bs. As. Argentina. 2Royal Netherlands Institute for Sea Research; P.O. Box 59, 1790 AB Den Burg, The Netherlands. 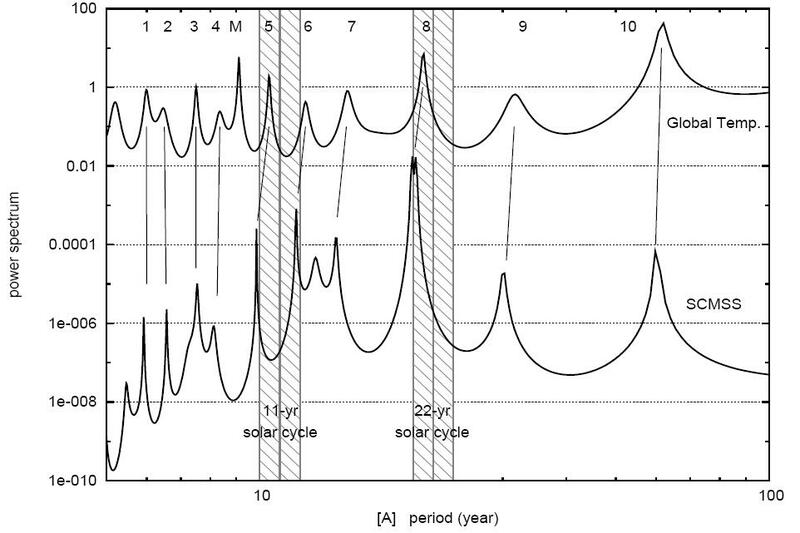 We summarize recent findings about periodicities in the solar tachocline and their physical interpretation. These lead us to conclude that solar variability is presently entering into a long Grand Minimum, this being an episode of very low solar activity, not shorter than a century. A consequence is an improvement of our earlier forecast of the strength at maximum of the present Schwabe cycle (#24). The maximum will be late (2013.5), with a sunspot number as low as 55. H/T to Paul Vaughan for the addendum. Which looks a lot like the old Keihl-Trenberth diagram, with snazzy colours. But, wait a minute! What happened to ‘Back Radiation from the atmosphere’?? We have long been told of the impending apocalypse due to Co2 in the atmosphere increasing due to our emissions from our cars, homes, energy plants etc causing more heat to be re-radiated from the atmosphere back to earth. 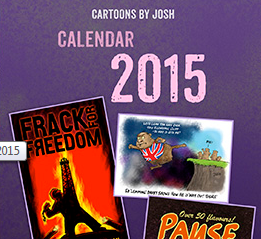 See over on the right there, 324 Watts per square metre of back radiation from ‘Greenhouse Gases’. Where’s it gone? Maybe it has something to do with the discovery by a trio of scientists that NASA gave up using the Stefan Bolzmann equation when they did the moon landings. Martin Hertzberg, PhD, Consultant in Science and Technology, Hans Schreuder, retired analytical chemist, and Alan Siddons, former radiochemist discovered NASA already knew the Moon absorbs a lot of heat and gives it up later, the daytime surface temperature turned out to be 20 degrees lower than expected, and the night-time temperature 60 (yes 60 Kelvin) degrees higher than expected from simple black body equations. See the paper ‘A Greenhouse Effect on the Moon?’ here. I have been saying for a long time now that the oceans absorb a lot of energy direct from the sun (not from ‘back radiation’, as the longwave doesn’t penetrate the oceans surface beyond it’s own wavelength) and releases it when solar activity is low. The new figure of 51% of the sun’s radiation incident on the Earth being absorbed by the land and oceans means there is quite a few Watts/m^2 more than previously thought. 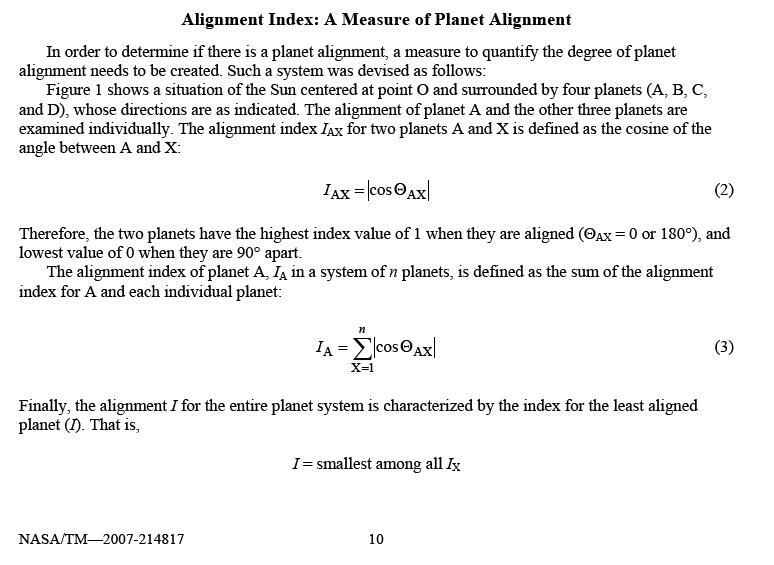 I’ll need to revisit my calcs as this will affect my climate sensitivity calculations. From greenhouse gases: Old:324 New: zero Diff: -324 !!!!!!!!! Radiated by Surface: Old:390 New:72 Diff: -218 !!!!!!!!!! I’ll put the figures in a spreadsheet and do some totals when I get a minute. One thing is for sure, the science isn’t settled. Here’s what Kevin Trenberth said in private email released with the rest of the ‘climategate’ material. Indeed Kevin, indeed. Maybe a few hours spent understanding the energy absorbative capacity of water relative to long and shortwave radiation might help? Nicola Scafetta sent me a pre-print of his new paper yesterday. The full pre-print can be downloaded here: http://arxiv.org/abs/1005.4639. In the meantime, here is the abstract. We investigate whether or not the decadal and multi-decadal climate oscillations have an astronomical origin. Several global surface temperature records since 1850 and records deduced from the orbits of the planets present very similar power spectra. 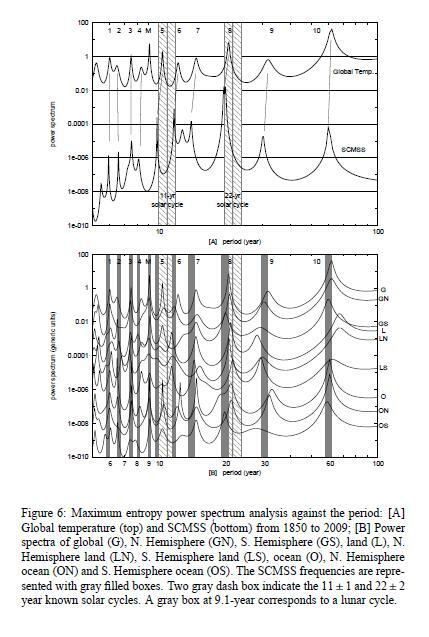 Eleven frequencies with period between 5 and 100 years closely correspond in the two records. Among them, large climate oscillations with peak-to-trough amplitude of about 0.1 oC and 0.25 oC, and periods of about 20 and 60 years, respectively, are synchronized to the orbital periods of Jupiter and Saturn. 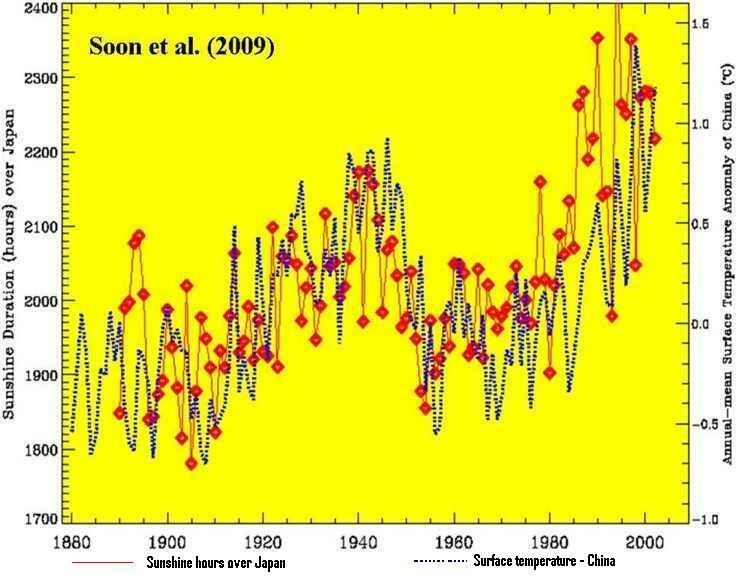 Schwabe and Hale solar cycles are also visible in the temperature records. 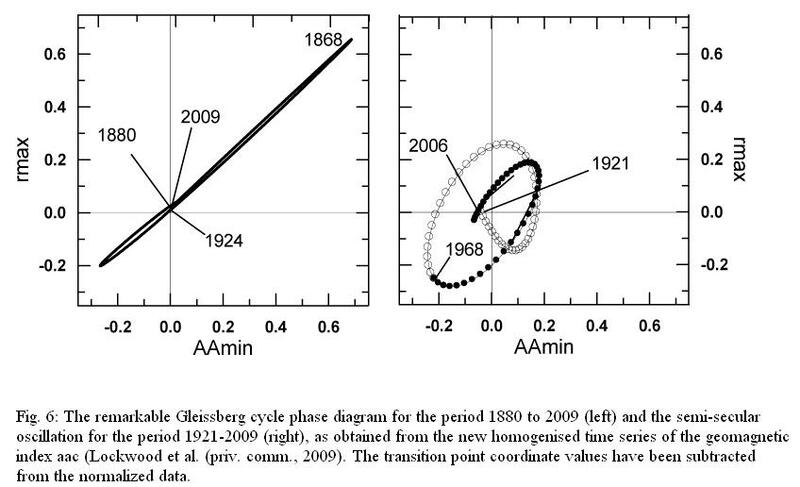 A 9.1-year cycle is synchronized to the Moon’s orbital cycles. 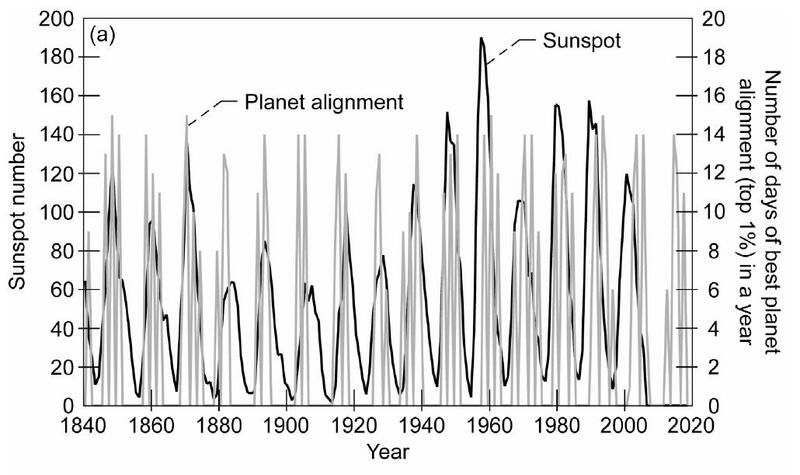 A phenomenological model based on these astronomical cycles can be used to well reconstruct the temperature oscillations since 1850 and to make partial forecasts for the 21st century. It is found that at least 60% of the global warming observed since 1970 has been induced by the combined effect of the above natural climate oscillations. The partial forecast indicates that climate may stabilize or cool until 2030-2040. Possible physical mechanisms are qualitatively discussed with an emphasis on the phenomenon of collective synchronization of coupled oscillators.